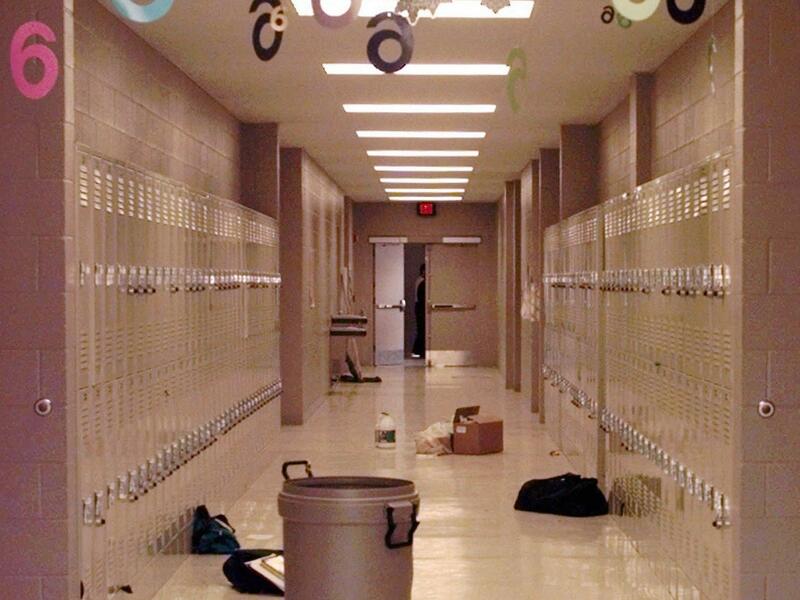 Backpacks and cleaning supplies lie in the hallway of Westside Middle School in Jonesboro, Ark., on March 25, 1998, one day after the shooting. 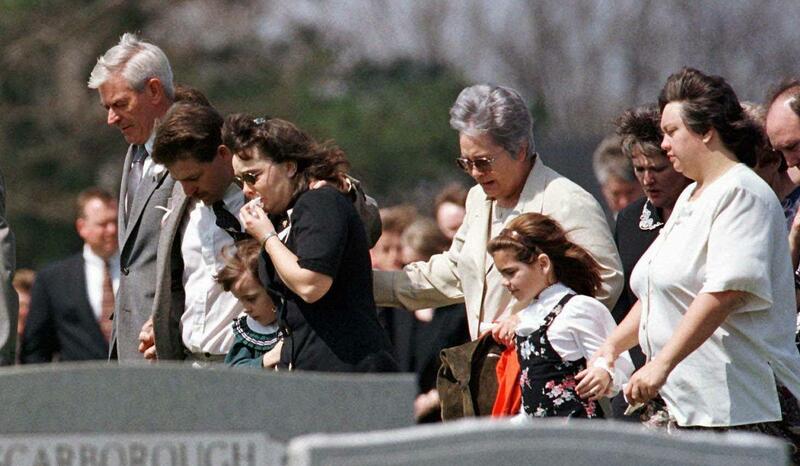 Family members of Paige Ann Herring walk to her gravesite on March 27, 1998. Mary Hollis Inboden, who was Paige's best friend, says one of the worst moments of her life was when Paige's mother frantically opened the gym office door and screamed her daughter's name. 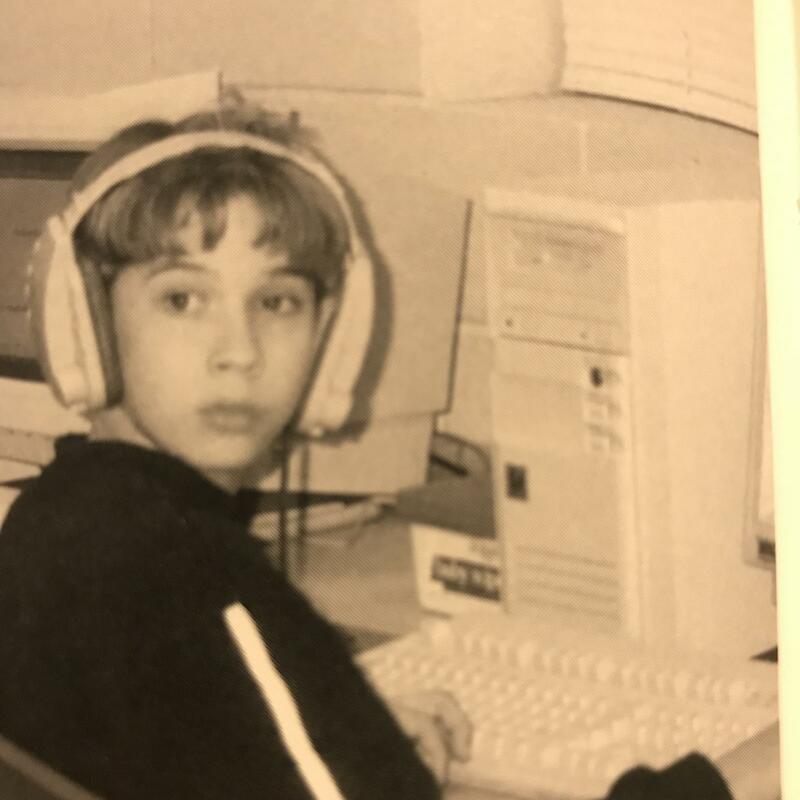 Cody Barnhill around age 11. Cody Barnhill, now 32, says he wishes he could have jumped in front of other students, like a teacher did, or do something more. Jonesboro shooter Mitchell Johnson in 2008 at age 23, while on trial in Fayetteville, Ark. In 1998, Johnson and 11-year-old schoolmate Andrew Golden were convicted of murder and sentenced to juvenile prison; each was by law released on his 21st birthday with no criminal record. Twenty years ago Saturday, two middle school students outside Jonesboro, Ark., lured their 11- and 12-year-old classmates out of school and opened fire from across the playground. They killed four students, all girls, and a teacher, wounding 10 others. When the Columbine High School shooting occurred the following year in Littleton, Colo., the horror at Westside Middle School was, in effect, superseded. As the years passed, Columbine became the touchstone, the school shooting everyone remembered. And it left the survivors in Jonesboro feeling forgotten and even more bereft. "It feels like we're lost in a sea of shootings that came after," said Mary Hollis Inboden. She was a student at Westside Middle School who saw her best friend die that day — in sixth grade. The Westside Middle School survivors have banded together in recent years, with the help of a Facebook page, to console each other and share a grief that never goes away. But the most recent school shooting in Parkland, Fla., divided the group along with the rest of the country. The fact that Saturday's march on Washington in favor of stricter gun regulations falls on the 20th anniversary of their school shooting also leaves the Jonesboro survivors with mixed emotions. Many are uncomfortable that the march falls on a day still so painful for them. The Westside shooting had its own unique element of horror. The shooters were so young, themselves students at Westside, and it's still technically the worst mass murder at a middle school in U.S. history. The shooters were Andrew Golden, 11, who was born and raised in Jonesboro, and Mitchell Johnson, 13, who was from Minnesota but had lived in Jonesboro for four years. Their ambush was carefully planned. Golden and Johnson stole nine weapons and 2,000 rounds of ammunition from their parents' and grandparents' homes, took Johnson's stepfather's minivan and the next morning headed to Westside. After lunch, Golden ran inside and pulled the fire alarm and then ran back to the edge of a field where Johnson was hiding. As the children and teachers spilled out, the two boys began to shoot, using deer rifles, from 100 yards away. As the students began to fall there was panic and confusion, and one student shouted, "It's all fake." One girl was shot and killed trying to drag her wounded friends to safety. English teacher Shannon Wright saw that a student named Emma Pittman was being shot at and stepped in front of her. Wright was herself shot and died later that evening at the hospital. Cody Barnhill, 12 at the time, was in an art class that was evacuated into the parking lot. He could hear the shots and screaming around the corner. Eventually, he and his classmates were herded back into the gymnasium, where bullets could be heard ricocheting off the outside bricks and walls. Barnhill was able to wander back into the hallway, where he could see first responders loading the wounded onto stretchers, and says he thought about going outside the school again, to see if he could help, but then the shooting stopped. "You're all too late. Everyone's too late." It was the first awful nugget of what would grow into a crushing weight of survivor's guilt that haunts him to this day. Inboden, now an actress in Los Angeles who has written a play about the shooting, recalls being in reading class that day when the fire alarm went off. Once on the playground, she remembers, she heard pops and saw classmates falling down, including a girl who fell at her feet. "When I looked down it wasn't clear to me in the moment that she had been shot. But it was clear that she was hurt. And then people started running through these falling bodies. That's when I knew that we were in danger. I just didn't know from what." She saw her best friend, Paige Ann Herring, lying on the ground and clapped her hands as she ran past, yelling "Paige, Paige," but she remained motionless. Inside the gym a girl told Inboden that her stomach hurt, but it wasn't until the child pulled up her shirt and Inboden saw a bullet hole in the girl's stomach that she finally understood what was happening. Inboden says one of the worst moments was when Paige's mother frantically opened the gym office door, screaming her daughter's name. She was one of the first parents to arrive. Though Inboden was beginning to understand that Paige was dead on the sidewalk outside, all she could think of was a powerful need to ask Paige's mother to take her home. She didn't, but she says she thinks of that moment all the time. The general feeling in Jonesboro was that things would get back to normal as quickly as possible. But Barnhill said everyone regarded the "shooting class" with wariness afterward. Nobody knew what to expect or how to proceed with these particular 11- and 12-year-olds. They were considered different. Should adults be a bit more lenient? What about the kids who were slacking off their schoolwork or acting out in class? Be nicer, don't be nicer, be afraid of them, don't be afraid — they're fine. It was all uncharted territory and educators in Jonesboro were winging it. Now 32 and a college administrator in Memphis, Tenn., Barnhill says he wishes he could have jumped in front of other students, like the teacher did, or do something more. But when asked if he too wouldn't have been shot down — there is a pause and he finally replies, though without conviction, "Yeah, that's probably right." Inboden says she always wanted to become an actress and Herring an entertainer, and they would play music together. Inboden says today she thinks of Herring every day. "I felt by continuing to do it she would be with me and I would please her in that faraway place that she was," she said. 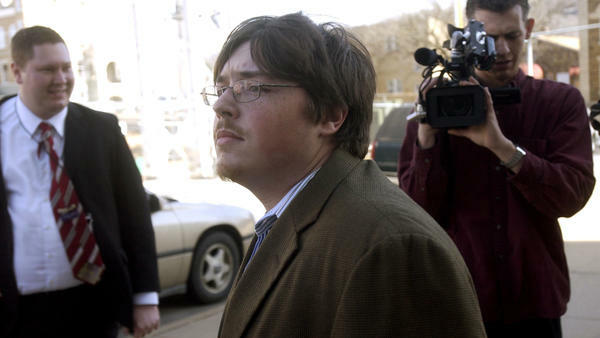 The shooters, Andrew Golden and Mitchell Johnson, were convicted of murder and sent to juvenile prison. But by law they were released on their 21st birthdays with no criminal records. Their release frightened the victims at Westside and worried the town of Jonesboro. Would the shooters return and try to finish what they had started? Johnson eventually was rearrested for other crimes and was sentenced to federal prison. Golden changed his name and moved away. Barnhill is deeply bitter that Golden is free. He says it combines with his survivor's guilt to make for an emotional stew that he is desperate to leave behind. For the Westside victims, the recent Florida shooting has elicited a range of emotions. Some felt it was too soon for the Parkland students to step in front of the cameras. Others didn't think turning anger into political activism was appropriate and many didn't like the direction of the student activism itself — gun control. The dialogue online, which picked up right after the shooting, was respectful but increasingly strained. One side said more guns were the answer, teachers with guns, guards with guns, the schools must arm themselves and be prepared. Others believed that prevention, not preparation is the answer — but in this group they were in the minority. "I think it's sad we've come to this, that I have to send my second-grade daughter to school and expect that a teacher is going to have to protect her," said Heather Brand, 31, who survived the shooting, married another survivor, and is now a middle school teacher herself in the Jonesboro area. "To me, that's crazy." The memories are still so raw that Brand excuses herself when her school holds active-shooter preparedness drills. She named one of her daughters after a young girl who died in the shooting. For Barnhill, the activism of students across the country after the Florida shooting has made him happier and more hopeful for the country than he has ever been. 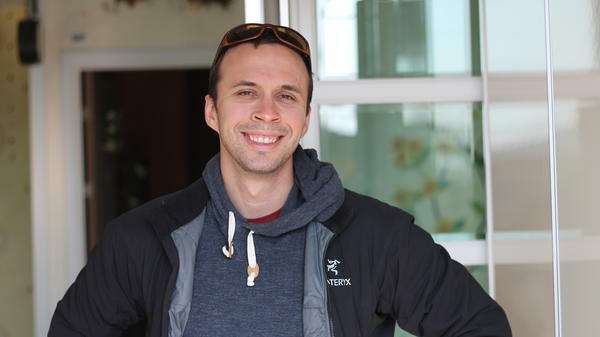 He and Inboden plan to travel to Washington Saturday to join the "March for Our Lives." Inboden said at first some Westside survivors resented that the march would again overshadow their grief on the anniversary. "The thing that I think people forget about shooting survivors is that we don't go away, and we have to get up and march through," she said. "And something that's happened to me in these 20 years is that I don't just mourn Westside. I mourn all of the shootings together. They've attached themselves to Westside, for me."